significance for all of us. lives. All of these are demonstrations of compassion and respect. another’s wish, and also a fountain that nourishes the lives of all. selfish love into higher respect and love for all sentient beings. Thus compassion and respect are vital to a harmonious human world. differences, which will make our moral characters noble and perfect. spectacular blossoming of different flowers. to embrace all phenomena in this world will give us the entire world. full of harmony, peace, and joy. and poor, men and women, and old and young. that wars, chaos, and disputes continue to arise in this world. the pride and rights of others is the true meaning of equality. shared world,” which is also the “global village” is realized. single taste is poor, and sameness makes no value. explains the importance of harmonious conditions. The so-called “harmony” does not mean making everyone the same; instead it is about discovering similarities amongst the different, and embracing differences amongst the similar. to ensure the presence of harmonious conditions. I would like to end my speech with a story on the significance of harmonious conditions. “Your majesty, can you isolate the spicy, sour, salty and sweet tastes from this broth? better future for humanity as one. harvest, and that you be surrounded with harmonious conditions. per cent, according to National Election Watch data. account for an average asset increase of over 130 per cent. Crorepatis in Delhi, the increase since 2004 is 755 per cent, while it is about 450 per cent in Mumbai. all the candidates are crorepatis. from west Delhi – has 25.6 per cent crorepati candidates. in the male dominated bastion of Indian politics. Banerjee and of course Jayalalitha. the 2004 LS polls while Mayawati had barely managed to cut the grade. future government on these well-rounded feminine shoulders. bagged 26 out of the total 42 LS seats in the state. vowing to vote out their political opponents. Party, to emerge from the contest with flying colours. the top office on the Race Course Road. batting on an uneasy wicket. Tamil population in Sri Lanka wrecking havoc on the DMK in the state. crunched between a rock and a hard place. been developed with the amount. of the state,” Mayawati said at an election rally in Etawah district. Saifai village is situated in Etawah, about 200 km from here. The BSP chief also accused Mulayam Singh of promoting dynastic politics. She said if this had not happened, Mulayam Singh and his family members would have been grazing cattle under a feudal lord. Sanjay Dutt as its nominee. and pappi to the people along with Amar Singh,” she said. to exist as all the criminals were there only. welfare of aboriginal inhabitants in Jambudipa. Tribes) in Prabuddha Bharath are subjected to inhuman treatment. lower castes to pray in temples or fetch water from their wells. The allegations have been dismissed as baseless by Dr. Kuldeep Singh of Bahujan Samaj Party (BSP). other country of the world,” said Dr. Singh. religion have the Right to Equality. LESSON 52-Power was in wrong hands for 61 years-Well it seems that press is to suppress the facts and impress the frauds in SC/ST (Aboriginal Inhabitants of Jambudipa, that is, the Great Prabuddha Bharath. 33 millionaires among candidates for Delhi’s 7 seatsMayawati accuses Congress of being anti-SC/STs-Mulayam misused development funds: Mayawati-Eight candidates left in fray for Hamirpur in Himachal-Mangat Ram(Bahujan Samaj Party)-33 millionaires among candidates for Delhi’s 7 seats-Well it seems that press is to suppress the facts and impress the frauds in SC/ST (Aboriginal Inhabitants of Jambudipa, that is, the Great Prabuddha Bharath. Ms. Mayawati said the Congress ruled U.P. for about 40 years and in the Centre for about half a decade, yet there had been a quantum increase in poverty and unemployment. Ms. Mayawati also promised to enforce separate quota for the poor among forward castes if the BSP formed the government at the Centre. Addressing an election rally at the Maiku Lal Inter College ground in Telibagh here in support of the BSP candidates, Akhilesh Das Gupta (Lucknow) and Jai Prakash Rawat (Mohanlalganj-R ), Ms. Mayawati said the problems confronting the sarv samaj remain unsolved for 61 years since Independence. Taking potshots at a Congress leader, the BSP president remarked merely spending a night at a SC/ST household would not solve the problem of poverty and unemployment. Ms. Mayawati flayed the attempts of the Samajwadi Party, the Congress and the Bharatiya Janata Party to defame her and the BSP by raking up the issue of memorials for BSP icons, Bhim Rao Ambedkar and Kanshi Ram, in Lucknow. She said almost the double the size of the land used for building memorials to Mr. Ambedkar and Mr. Kanshi Ram has been used in Rajghat, which houses memorials of Gandhi and Nehru families. The BSP chief questioned the silence of the Opposition parties and the media on this aspect. Ms. Mayawati said Mulayam Singh spent more money on developing a single village, Saifai, adding that the same money could have been utilised in the development of about 1,000 villages in Uttar Pradesh. BJP candidate Lalji Tandon was relying on the letter, supposedly written by Atal Behari Vajpayee, who has been keeping ill-health. Ms. Mayawati slammed actor Sanjay Dutt for his objectionable remarks against her. Ms. Mayawati said the condition of the “sarv samaj” would improve only with the BSP in power at the Centre. For the last 61 years, power has remained in the wrong hands, whether it has been the Congress, the BJP or their allies. Addressing another poll rally in Mr. Mulayam Singh’s home district, Etawah, on Monday, Ms. Mayawati said the ongoing polls provided a golden opportunity to elect a “Dalit ki beti” as the PM, and thus fulfil the dreams of Ambedkar and Kanshi Ram. In Etawah, she canvassed for Govind Chaudhary (Etawah), Mahesh Chandra Verma (Kannauj) and Vijay Shakya (Mainpuri). Terming Congress as anti-SC/STs, BSP supremo Mayawati on Sunday accused the Nehru-Gandhi family of having always opposed Bhimrao Ambedkar as it did not want to see the Scheduled Caste leader in Parliament. “Nehru-Gandhi family always opposed Dr Ambedkar and it did not want to see the SC leader in Parliament. This was why when he (Ambedkar) contested the Lok Sabha polls from Maharashtra, Congress fielded candidate against him,” Mayawati said while addressing an election rally here. The Uttar Pradesh Chief Minister said Dr Ambedkar was opposed by the party when he contested election for becoming a member of the Constituent Assembly, which drafted the country’s Constitution. Holding the party responsible for the demolition of the Babri mosque, she said had the Congress government acted timely the mosque could have been saved in 1992. Highlighting achievements of the state goverment, she promised to provide reservation to the economically weak among the upper caste people and implement the Sachar Committee recommendations, if voted to power at the Centre. She said that Congress and BJP were responsible for the under development of the country as both the parties thought only of the industrialists and business houses which fund their elections. “Unlike BSP, which runs on the money collected from party workers, BJP and Congress get finance from industrialists and business houses and later oblige them”, she alleged. Lucknow, April 27 (Inditop) Uttar Pradesh Chief Minister and Bahujan Samaj Party supremo Mayawati Monday charged rival Samajwadi Party president Mulayam Singh Yadav with misusing the state’s development funds, saying that as many as 1,000 villages could have been developed with the amount. “The money spent by Mulayam Singh for giving a facelift to (his native village) Saifai alone could have brought development in 1,000 villages of the state,” Mayawati said at an election rally in Etawah district. Saifai village is situated in Etawah, about 200 km from here. New Delhi, April 27 (IANS) As many as 33 millionaires and 20 people with criminal records will fight for Delhi’s seven Lok Sabha seats that go to polls May 7. “A total of 33 ‘crorepatis’ are contesting elections in Delhi. Of 33, seven are from the Congress and five each from the Bahujan Samaj Party (BSP) and the Bharatiya Janata Party (BJP), a Delhi Election Watch (DEW) statement Monday said. Among major parties, the average assets per candidate for BSP is Rs1.13 billion (Rs.113 crores), Congress Rs.70 million (Rs.7 crores) and BJP Rs.20 million (Rs.2 crores), the statement added. Two candidates have declared their assets as zero, and four have declared assets of less than Rs 20,000, while 42 percent of the total candidates have not furnished their PAN card details as compared to 65 percent in 2004. The average increase in individual assets has been 755 percent with one candidate showing a jump of over 3000 percent and most of them showing increase in three digits. Of 160 candidates in the fray, the DEW looked into affidavits of 158 candidates and found that 20 candidates (12.5 percent) have criminal records. “The Bharatiya Janata Party (BJP) has fielded four candidates with criminal records and the Congress has given ticket to one candidate with criminal record,” according to the statement. “There are seven candidates who are charged with heinous crimes which includes murder, attempt to murder, kidnapping and extortion. Amongst major parties, the BSP has fielded maximum (2) number of candidates with serious crimes in Delhi. No other major party has fielded any such candidates,” the statement added. Delhi Election Watch (DEW) is part of a nationwide National Election Watch (NEW) campaign, comprising more than 1200 NGOs and other citizen organisations working on electoral reforms, improving democracy and governance in India. Well it seems that press is to suppress the facts and impress the frauds in SC/ST (Aboriginal Inhabitants of Jambudipa, that is, the Great Prabuddha Bharath. What “Newsweek” editor know about Indian caste system? Has he ever even tried to know what being a Scheduled Caste/Scheduled Tribe (Aboriginal Inhabitants of Jambudipa, that is, the Great Prabuddha Bharath). ( & more importantly SC women mean? Newsweek has shown anti-SC/ST, anti humanistic behavior by publishing such a piece of news. 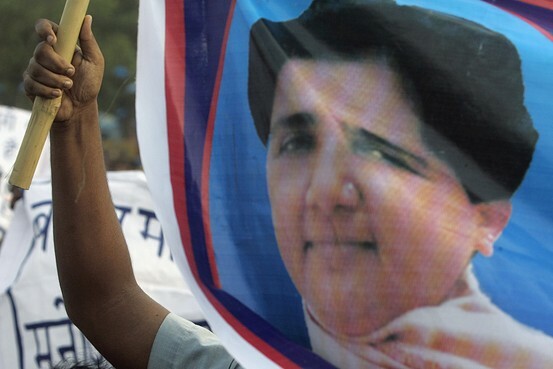 How can Newsweek say Mayawati is “bigger threat” to India? Has she committed murders? Or has she been ever involved in riots like Advani & Kalyan Singh or any Hindutav organization like RSS, VHP? I think those who are jealous of Mayawati’s growth are giving money to publish such piece of news so as to tarnish Mayawati’s image. No, matter what these newspapers publish, Mayawati will be the bigger gainer of this election. This is shown by IBN Live survey that more than 4 lakh people have voted for Mayawati & she is ahead of Sonia Gandhi, who got only 94 thousand votes. IBN Live survey shows clearly Mayawati is “Best Women Politician ” in India. Napoleon Once said that he can face two battalions but not two scribes of a NEWS PAPER! are the industrialists and business houses, fundamentalist’s and Casteist,s organisations’ like RSS,s and VHP’s VIIEWS PAPER! Which are unfit even to be a TOILET PAPER! Every Sarvajan Samaj must stop buying such PAPERS! And start their websites own NEWS PAPERS! But Restrain from throwing cow dungs and shoes on the journalists of these TOILET PAPERS! “On her arrival Behenji will bring shade” - a BSP worker in Maharashtra attending a rally held on an open ground in summer. An interesting scenario will be a climb down in performance for the ruling United Progressive Alliance led by the dynastic Congress party and the National Democratic Alliance led by the communal Bharathiya Janata Party to the extent of two digits of MP seats. A simple majority of 272 is required to form the government in the Indian Parliament which has a total of 543 MP seats. The Congress party won just 145 seats and the BJP just 138 seats in the last election. The Congress party was able to form the current government in 2004 with the support of allies in UPA. But after five years, both UPA and NDA have lost their allies. Therefore it will not be a surprise, if these two major political parties win less than 100 seats each. In a pathetic situation to claim third and fourth position, Congress party and BJP are highlighting hate speech of immature Varun Gandhi in Uttar Pradesh, the largest state in India with 80 parliamentary seats. They both are still resorting to the old tactic of diverting attention of the people from real issues. This is the place where Behanji Mayawati is ruling like a queen with simple majority won on her own in the assembly elections of 2007. And according to latest projections Mayawati’s Bahujan Samaj Party (BSP) will win all 80 MP seats in Uttar Pradesh alone. And her expanding influence in the neighboring states will bring her more numbers. Mayawati is said to be the highest income-tax payer among all politicians in India paying Rs. 26 crore for year 2007-08. Coming from a Scheduled Caste (Aboriginal Inhabitant of Jambudipa, that is, the Great Prabuddha Bharath family, Mayawati made her way to the seat of Chief Minister of Uttar Pradesh, the most populated state of India.She had asked the Central government Rs.80,000 crores for the development of UP. But it was refused. Now she needs the entire budget amount and also the black money Rs.75 lakh crores in swiss bank. Then she will be able to distribute the wealth among all section of the society for their welfare, happiness and peace. Mayawati has already contacted Left Parties, JD Secular, Telugu Desam and many more regional players who either endorse her ambition for the post of Prime Minister or show no aversion to this idea. Considering this support base, Mayawati already enjoys the backing of about 130 MPs in the current parliament itself, very close to the individual scores of 145 and 138 of Congress and BJP respectively. In this era of alliance politics and coalition governance, there is a fluid circumstance wherein the viscosity of a minor political party is very low and it can gravitate naturally towards any major winner to get a share of power throwing away the so called policies. It is only a matter of time that Behenji collects more brothers such as Nitish kumar or Lallu, Sharath Pawar, Naveen Patnaik, Karunanithi and small fence sitters like PMK, in the post poll situation. (The sisters like Mamtha and Jayalalitha still hold their secrets close to their heart ). All these are in addition to her own number 272 and above. However alarmed at the possibility of Mayawati becoming the prime minister, both Congress and BJP have initiated a game plan. Both these major parties have plans that in the event of formation of a Non BJP Non Congress ( NBNC) government with the support of any one of these major parties, they will press to have a Prime minister of their choice only. As a preparation the BJP projects Jayalalitha and Congress projects Pawar for the top job. If Mayawati is sidelined by such arrangements, India should be prepared for another puppet show. Such manipulations may not hold long since the BSP is emerging as the first largest party at national level commanding support across the country. Political observers are calling Behenji as a Barack Obama in making for India. But the BSP workers laugh at it and say that she became a Chief Minister of the most populous state of India beating many parties well before the American elections and therefore only Barack obama should be called as “Mayawati of America”. Not only that he simply followed “A vote and a note”, even after he got elected, a concept of Manyawar Kanshi Ram Ji. This reality makes the media to telecast shrill cries against Behenji and our print media is still not ready to come to terms with the phenomenon called Mayawati who has been profiled by the US magazine Newsweek as among eight women leaders worldwide who have reached the top despite all odds. The commentators are asking why she is openly declaring her ambition as Prime Minister candidate instead of coming with policies and manifestoes. Her becoming Prime Minister is largely in the interest of welfare, happiness and peace for the entire people, i.e., Sarvajan Hithayi, sarvajan Sukhaiy. It is open secret that many politicians aspire to be Prime Minister but are not sincere and confident in admitting their ambition. There could be no hiding of the nature that a cat should love to dish on fish. The fundamentalists who celebrate birthdays of many gods unnecessarily taking thousands of idols in processsion, point out that Mayawati is lavish in celebrating birthdays and erecting her own statues. But see, the same people are convenient with Jayalalitha who was known for erecting giant cut outs of her own image and conducting extravagant marriage of her foster son. for Mayawati’s rallies nearly one crore people gather to show their gratitude for protecting their self-respect. Our people may be poor, but if they start liking their leader, they will give anything they have including their life. they have demonstrated this to leaders like MGR where they used to buy a ten Rupees ticket of his movies for even Rs.100. For the Buddha, to spread his teachings, a man purchased Jetavana spreading gold pieces all over the beautiful garden, which was the price. Such a thing will repeat in this great Prabuddha Bharath, i.e., Jambudipa. And the status quoists are the most concerned about the elevation of Mayawati as the Prime Minister of India. We need not discuss the reasons since they are obvious. The very queuing of rich business houses such as Tatas and Ambanis and expression of their wishes to make Narendra Modi as Prime minister can tell the rest of the story. Our Behenji is speaking for the poor and therefore she will not get anything from the rich. She is demanding neither money nor votes from the rich. She has earned the love of the poor. India is a vibrant democracy where a farmer in a remote corner of Uttar Pradesh and the likes of Tatas and Ambanis are having a vote each and are equal at least on the day of election. By numbers, poor outnumber the rich by many fold - thanks to the past inefficient rule of Congress, BJP and disgruntled alliances. The money power, caste calculations and the fundamentalist designs in the post poll arrangements will never succeed in preventing Mayawati in 2009, Behenji after improving her chances in 2009 shall become the Prime Minister of India in 2009. Yes, she is set to be the Prime Minister here and now. With these qualities, Behenji has demonstrated her Courage of beating a political opponent , implemented Sharing of political power to all communities, shown her Wisdom of following the footsteps of Dr. Ambedkar, the champion of downtrodden, and possess the Energy to lead this country and what else is expected to become a ruler? In 2007 Bahen MAYAWATI became UP CM! Malarthamil is a civil engineer and writer-poet inspired by Thirukkural - a classical Tamil poetry that expounds various aspects of life. She has earned the love of the poor. India is a vibrant democracy where a farmer in a remote corner of Uttar Pradesh and the likes of Tatas and Ambanis are having a vote each and are equal at least on the day of election. By numbers, poor outnumber the rich by many fold - thanks to the past inefficient rule of Congress, BJP and disgruntled alliances. India has waited for 60 years, to listen to the poor, to really really reap the benefits of democracy. It looks like the time has come. >point out that Mayawati is lavish in celebrating birthdays and erecting her own statues. But see, the same people are convenient with Jayalalitha who was known for erecting giant cut outs of her own image and conducting extravagant marriage of her foster son. It is true the other way around also, isn’t it? People who weren’t comfortable with pompous Jaya do not have any problem with Maya. >……elevation of Mayawati as the Prime Minister of India. We need not discuss the reasons since they are obvious. Really! But there were no objections for Mayawathi’s elevation as CM before when she allied with the *communals*, which she used cleverly to establish a base. Very convenient comparison! Surely logic calls for differentiating between a party that ruled us for several decades and a party that was given the mandate for only a couple of terms! It seems, in India, rationality deserts both seculars and fundamentalists! She will be most welcome to lead India, provided she proves in her home state. Prakash Such proof was not invited from Manmohan or Rajiv in their home states or anywhere else. Is it because they are qualified by birth? Whatever arguement against Mayawati becoming a PM fails as people who had lesser qualification, experience became PM by circumstances. Guest, thanks for accepting the last paragraph if not the other. LESSON 50-Mayawati says a ‘Aboriginal Inhabitant of jambudvipa, that is, the Great Prabuddha (Scheduled Caste)’s daughter’ should be made next PM-The Significance of Uttar Pradesh-EC issues notice to Congress leader Digvijay Singh for violating Model Code- Read this article and the comments, I have been having a good discussion with the author of the article from Wall street Journal. Caste)’s daughter’ should be made the Prime Minister of the country. the upliftment of the backward and minority communities in the country. The UP Chief Minister also asked people to vote for her party to ensure state’s development. state, the country and Uttar Pradesh will not progress,” she added. 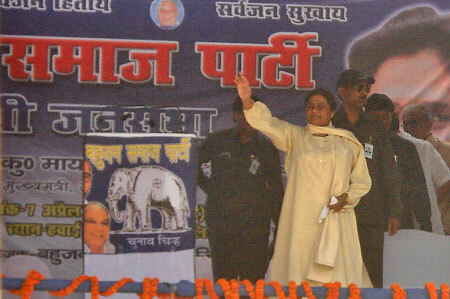 Mayawati also criticized Prime Minister Dr. Manmohan Singh for criticizing her government’s track-record on development. “The Prime Minister is not at fault. He will speak what the Congress leaders will tell him to say,” she added. The BSP supremo further said the Congress party was nervous about the growing support base of her party. party to withdraw support to the alliance,” Mayawati added. remains, the largest contributor of parliamentarians to the Lok Sabha. played the role of a political bellwether in the first nine elections. caste and religion based politics. the entire people, and on the other was the religion defined BJP. share of the same pie. dominant political constituency around a radical-right Hindutva agenda. position and thus found themselves inadequate without political allies. were not anymore willing to be passive recipients of patronage. to become the first party in many years to get a simple majority. voters who brought the change well against their traditional mind set. the BJP, which has been accusing Congress of devaluing crucial institutions such as the Election Commission, CBI and the Rashtrapati Bhawan. party to harass its political opponents. she will be in trouble,” he told the rally. A supporter of Bahujan Samaj Party holds a poster of Mayawati during a campaign rally in Kolkata Tuesday. needs. Is that not what all Politicians should be striving for. privatization when it was not popular in our political establishment. party and with that comes a lot of stigma. Sashikanth: Fair enough; not going to argue with the permanency aspect. India who cover BSP without any bias. no clue BSP will win absolute majority. the country”. And what does that mean anyway? of power in New Delhi. far greater experience in dealing with coalitions. 2009? Tough - for a variety of reasons. growing the entire nation bottom up. and after it, you will notice the country is fairing much better after. and all the other SC/ST leaders. I agree may not become PM in 2009, but she will become PM in her lifetime. oxymoron we live with in India? Paul, you must understand that money without self respect is of no use. caste than my merit if they come to know which I caste I belong too. expect from people who are not educated? the which caste you were born in to. do not address. That is the main reason they will not get the backing. felt all are equal. Therefore, untouchabilty is punishable under law. Thanx 4 voting 4 Bahen Mayawati as UP CM! NOW MAHAMAYAwati PRABUDDHA d BHARATHA MATA 2 B PM! were making all out effort to stall the BSP’s crusade towards Delhi. of other states too want development like Uttar Pradesh in their states. Several senior trade leaders associated with Banwari Lal Kanchal joined the party today. week, said these new entrants would dedicate themselves for the party. party to form a BSP Government at the Centre. candidates,” Mayawati said while addressing an election rally here. belonging to the backward classes. from the businessmen or the rich persons to form a government. busy in hobnobbing with Left. been in full swing from that time on. campaigning ended Tuesday for 17 of the 28 Lok Sabha seats in Karnataka. According to the state chief electoral officer (CEO) M. N.
with the BJP toping the list with 125 cases. The Congress faces 103 cases and Janata Dal-Secular (JD-S) 60. 1800-4250-100 for the public to report any poll code violations. written and sung for the empress of India’s largest state. Now, Maya Govt. books Cong, Samajwadi for communal ads! religion-based appeals in a newspaper, police said Friday. Rameshwar Maurya told IANS over phone. to public mischief) of the IPC, police said. inquiry after the appeal was issued in the local newspaper. The first phase had 222 candidates with criminal records. Samajwadi Party has 13 such candidates. with 39 and Jharkhand with 34 such candidates. Polling in the second phase will be held in 13 states. MYSORE: Mysore, Chamarajanagar and Mandya too have their share of crorepati candidates, with four each in the constituencies. records in the second phase of the election in the State. Mysore, according to a report of the NEW. coming out of their homes. First B Buddhist 4 Quality! Buddhist monuments spread throughout this great Prabuddha Bharath. new found fame as the wealthiest candidate in the Lok Sabha polls. “serve the poor better” and should get more nominations in elections. He also likens party chief and Uttar Pradesh Chief Minister Mayawati to “an army commander” who keeps factionalism at bay. candidate so far in these elections. assets worth over Rs.500 crores (Rs.5 billion). elections,” 58-year-old Bhardwaj told IANS. Bhardwaj, who says he works 20 hours a day for the elections. besides owning a small township in Haridwar. candidate Mahabal Mishra from West Delhi. society’,” the father of two said. many cities in the country and turned him into a billionaire. for Democratic Reforms and the National Election Watch suggests. candidates in the fray, but details of only 1,440 are available as yet. the 314 candidates in the first phase, 64 are millionaire candidates. Uttar Pradesh and Maharashtra are at second and third position with 35 and 29 such candidates respectively. second and third place with 30 and 23 such candidates each. asset value of Rs 27 crore. The party has only two candidates. crorepatis has increased from 9 per cent in 2004 to 14 per cent in 2009. Patel Praful Manoharbhai of the NCP is the second richest candidate. candidates who have absolutely no assets, 50 are from Andhra Pradesh. It is a question that BSP chief Mayawati will think about carefully. party following such a system. his sister? That too by force with an AK-47 gun. traditional treatment he will get from them. Haveli and Daman & Diu. from INC (11), followed by BJP (6), BSP (3), CPI (2) and CPM (1). completed on the same day. Veshakha Purnima day under the guidance of its founder Venerable Buddharakkhita.